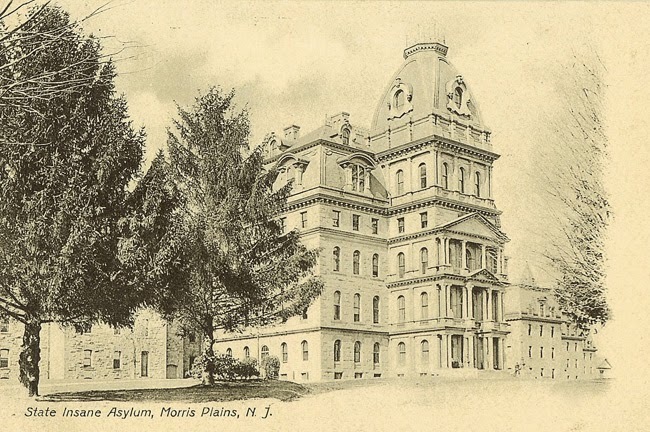 Greystone Park Psychiatric Hospital was originally built in 1876 as the New Jersey State Lunatic Asylum at Morristown. Obviously there was no “political correctness” at the time. If you grew up in Morris County, the original Greystone Park was legendary. It was so big looming up at the end of Central Avenue. It was actually the building with the largest footprint in America until The Pentagon was opened in 1943. There were also rumors about horrible events that actually went on in the building. It was also incredibly overcrowded. Probably the most famous resident was the great singer-songwriter Woody Guthrie. He spent 5 years at Greystone Park. Woody was suffering from Huntington's Disease, and little was understood about the illness. Sadly, he was sent to live in psychiatric hospitals for most of the last years of his life. Here he is singing probably his most famous song, the beautiful "This Land Is Your Land." The young Bob Dylan idolized Guthrie and visited him at Greystone! He sang his song "Song to Woody" for him when he visited. So touching, and how courageous of Bob to visit him there. The original building at Greystone is still located in Morris Plains/Parsippany, New Jersey (GPS and other places give either of the towns). A new hospital was built several years ago, and the patients transferred to the new facility. Some of the old structures have been torn down, but the original main building – the Kirkbride Building -- is still standing.There is now fencing around the building to get it ready for demolition (and probably to discourage intruders from breaking into the building). The building was supposed to be demolished last year, but a group called Preserve Greystone is fighting to save the building. The building is architecturally significant. It was built in the Second Empire Victorian style. Now I can understand why the state wants to tear down the building. It was used for rather sad reasons. I also understand that you can't save every historic building. You can read the Final Feasibility Assessment report here. However, I do believe that we don't save nearly enough architecturally significant buildings, in New Jersey or the entire USA. The building was quite beautiful inside, and has not deteriorated so badly that it can't be restored. They certainly don't make hospitals this beautiful anymore! Apparently, Woody Guthrie's daughter wants to save the building. Preserve Greystone makes some very good points about the historic value of the building. Some of those reasons are truly haunting. In this magnificent video, there are some stunning aerial shots of the hospital, including some by a drone! There are some truly haunting photos of the inside of the building here and here. I am saddened that they want to demolish such an historic building probably because of the reminders it would give of the horrors that took place there. The building could be given a new purpose. A well known 'lunatic asylum' in London - Bethlem from which the word bedlam originated moved from its original building but that building was reused and is now the Imperial War Museum. I think it would be best if they reused the building. It was very beautiful inside. What an amazing looking building. Such a shame they want to demolish it. It's great looking, isn't it? Especially on the inside. And I love the aerial shots from the drone! That is a beautiful building, but I bet it would cost a fortune to keep up if it's preserved. Probably, but there have apparently been some offers. I grew up in PA and (at least in my little clique) often heard folks sneering at NJ. Then I had the opportunity to travel through portions of Jersey and found it enchanting. My apologies - I should never have listened to unsubstantiated sneers! Thanks for reminding me that NJ can be and often is beautiful. It is a shame to demolish it. Thanks for visiting! Woof! Woof! A beatiful building but seemed to have a dark past. Thanks for sharing. Again this place is unknown to me until you shared infos and photos about it. A great tour! It most definitely has a dark past. I grew up in Morris County where we all knew about it and there were plenty of rumors going around. Thanks for visiting! Interesting. I love the architecture, and sometimes appreciate the political correctness. Lunatic Asylum just sounds so bad. Yes, "lunatic" and "insane" really does sound bad. Imagine building such a beautiful building for a state hospital. It would never happen today. Great post. I clicked through to see the interior photos. Disturbing, yes, but seems like such a piece of history. Hope the building is saved. I hope the building is saved, too. It could be put to good use. This place makes me shudder! What destinies! It definitely has a lot of sadness and creepiness surrounding it. Thanks for visiting!